L-R: Jayni Suero and Sue Kishana Bera. 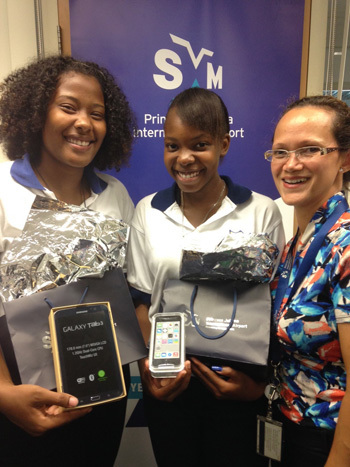 both of the St. Maarten Academy pose with their prizes along with Suzy Kartokromo, acting manager, Marketing and Customer Service Department at SXM Airport. (SXM photo). (November 8, 2013) - Three students, all of them of the St. Maarten Academy won prizes for having the most correct answers in a quiz organized by the Princess Juliana International Airport (SXM) during the highly successful Career and Study Fair held at the Belair Community Center, Thursday. The first prize of a Samsung Galaxy tablet was won by Jayni Suero, while the second prize consisting of a 5th generation iPod Touch went to Sue Kishana Bera. Damion Lee of St. Maarten Academy PSVE took the third prize of a Nikon digital camera. He was unable to attend the prize-giving ceremony held at the end of the Fair. Participants in the quiz were asked a total of 15 questions, all but five of which were multiple choice questions. The Quiz was obviously a big hit with the students who milled around the SXM Airport stand at the Fair to answer the questions. They also received information on career opportunities at the airport and were able to view videos of the Flash Mob dance held recently at the Meet and Greet area of the airport, which featured some of the students at the Fair. All the students who visited the SXM Airport stand received branded gift items and showed a lot of interest in the career opportunities the airport offers. “The Fair was very well-attended and we were very happy to see so many students interested in what the airport does and what careers they can study for to work there,” said Suzy Kartokromo, acting manager, Marketing and Customer Service Department at SXM.